While Apple has flirted with biometric-based patents before, we've yet to see them implemented in real-world technology. That hasn't stopped it from filing yet another one though, as the latest application reveals a fingerprint sensor apparently embedded into the iPhone itself. The patent describes a hardware "window" that can become selectively "transparent or opaque." When transparent, it would reveal a component comprised of an "image capture device, a strobe flash, a biometric sensor, a light sensor, a proximity sensor, or a solar panel, or a combination thereof" as a method of unlocking the phone. 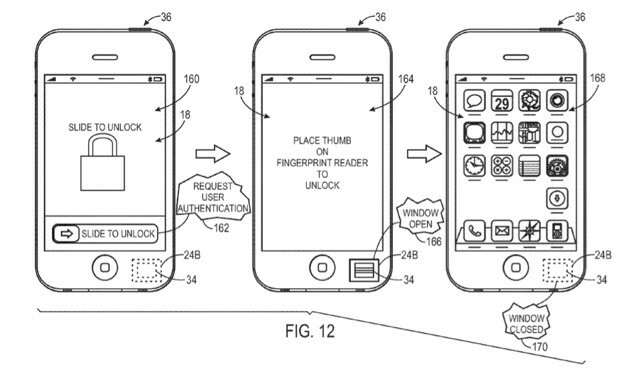 According to the filing, the biometric sensor in question might indeed comprise of a fingerprint reader. The document goes on to describe an alternative method using face or eye recognition technology that can be used not just for security purposes, but for possible e-commerce solutions like completing an online transaction. Of course, we take any of these patent applications with a generous pinch of salt -- we haven't seen an Apple stylus yet, for example -- but perhaps this is the reason Apple bought fingerprint sensor maker AuthenTec back in July. Apple files patent application for fingerprint sensor that can be transparent or opaque originally appeared on Engadget on Fri, 12 Oct 2012 04:51:00 EDT. Please see our terms for use of feeds.